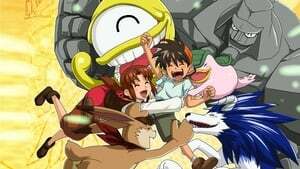 Monster Rancher, known in Japan as Monster Farm, is a 73-episode anime series based on Tecmo's Monster Rancher video game franchise. It originally aired on Japanese television on TBS from April 17, 1999 to September 30, 2001. An English-language version by Bohbot Entertainment aired in North America on Fox Kids. In Japan, the program existed as two separate series; Enbanseki no Himitsu for episodes 1-48 and Densetsu e no Michi for episodes 49-73.